Body worn camcorders have become an essential piece of equipment for law enforcement officers and security professionals. 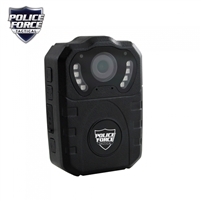 The Police Force Body Camera Pro HD can be used to capture evidence and to protect the integrity of both officer and potential offender. The wide angle (170 degree) infrared camera is loaded with features and designed to be worn by security professionals and used as a dash camera. With one touch recording you can quickly capture both audio and video with the 32 GB internal memory. The high capacity lithium battery provides up to 8 hours of recording time. With one touch recording, you will quickly be capturing great quality video in any lighting condition. Even in low-light settings, through the use of night vision, the camera can record up to 24 feet with facial recognition. Housed in IP56 weather proof ABS casing to protect the camera from rain or snow, it can be clipped to your uniform or used in the included dash mount (in addition to the AC charger, a car charger is also included). You can use the 2" color LCD with a built-in speaker to view your recordings in the field and when you need a larger display the camera's micro-USB output port can be used to connect to a TV or computer monitor. Easy to use buttons are located on the sides of the unit but for more convenient operation the remote control can be used to discretely begin recording video, audio only, or take photos. It can even take photos while recording video. The Police Force Body Camera Pro HD features a date and time stamp as well as a Device ID that can be assigned to each Body Camera for positive recollection of recorded events.